Do you need to prepare your final will and testament? here is a legal guide to crafting the last will in a way that respects and preserves your wishes properly. No one likes to talk about death. But if you aren't prepared with the last will before you go, you're leaving behind a huge legal mess for your family to clean up after you. If you're not sure where to begin, you've come to the right place. What is the Last Will? Let's start with the basics: what is the last will? In contrast, a Power of Attorney creates trust-based estate plan uses a revocable living trust. This governs what will happen to your estate and asset in the event that you are no longer able to make decisions about your estate on your own, as with dementia or a stroke; which come into existence on mental incapacity and end on death or recovery. If budget becomes an issue it may sometimes be more important to grant power of attorney or include a personal directive. Estate planning lawyers have a joke: "Where there is a will there is a relative". It is important to have a fully informed discussion with an experienced estate planning lawyer to ensure your last wishes are carried out and you have an emergency plan in place in case you cannot make decisions for yourself. Along with a good estate plan, it is also important to have proper life and disability insurance in place; and, a good lawyer should ask you about this aspect of your estate planning in your appointment as well. For the last will to be considered legally valid, there are certain formalities that must be observed with regards to how it is made. However, there are a few exceptions, which are listed below. Oral, spoken or "nuncupative" wills are relatively rare, as they are not recognized everywhere (and even then highly specific circumstances with rare validation). Oral wills are only created and validated when you are in imminent danger of death and they must be created in the presence of two witnesses. Video wills are a form of oral will and are not considered legally binding in areas that require a written will. A video will is permissible (in accepted jurisdictions) so long as the requirements for an oral will were met. The key benefit of a video will over a plain oral will is to prove sound mind and freedom from duress at the time of the will's creation. Finally, we come to holographic wills. These are a form of will which is written entirely by hand. Witnesses are not required, but two disinterested parties have to verify that the handwriting throughout the will is yours. Otherwise, the typical requirements for a valid written will apply. It is important to note that many holographic wills are deemed invalid by the Surrogate Court of Alberta; even, more important, is that many holographs are not thorough enough to cover the "what if" situations that a proper estate plan will cover. With that in mind, what are the legal requirements of the last will? Your estate lawyer can break down the requirements more specifically (and help make sure that you meet them) but here's what you should be looking out for. 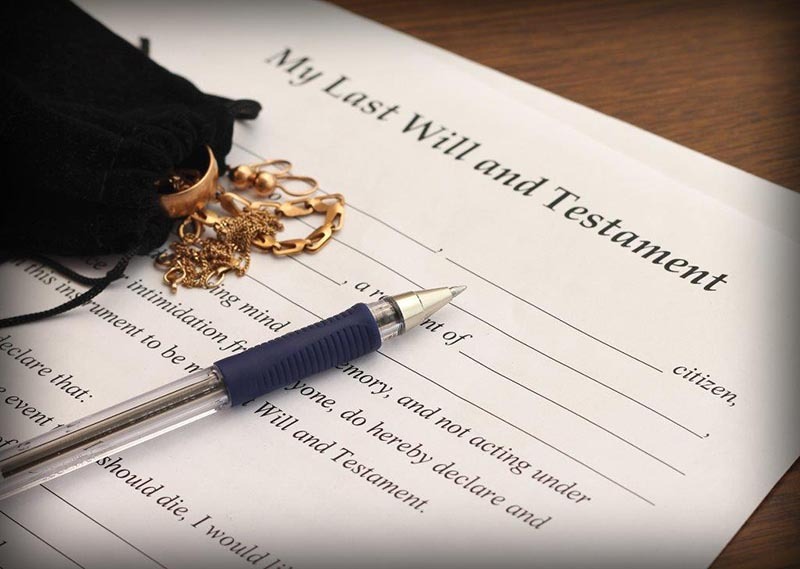 You may hear of a will referred to as the last will and testament. This is why you are often referred to as the testator, so the word "testamentary" refers to you. Testamentary intent means that you intend in no uncertain terms for this document to be your legally binding will. Your will should include specific language like "this is my last will and testament." It seems basic, but if this language isn't included, your beneficiaries could contest the will as invalid. Essentially, testamentary capacity means that you were of sound mind when you made the decision to create the last will as it currently reads. To be precise, testamentary capacity means that at the time of creating the will, you fully understood that you were creating a will, that you understood the nature of the property you own and how the will relates to it, and you fully understood the language being used and who would inherit your property. It also means that you fully understand who your beneficiaries are (or should be) in relation to the size of your estate. If you believe that someone might have reason to doubt your soundness of mind at the time of writing the will, you should get a doctor's letter included which states that you were lucid and of sound mind at the time of signing the will. In most places, you have to be at least 18 years old to create a legally binding last will and testament. However, there are some notable exceptions, particularly with underage military members, emancipated minors, or if a minor has inherited a large sum of money. If you are a minor, talk to your lawyer about your circumstances. In most areas, you need at least two adult witnesses to sign the will, though some areas require more. This is particularly important if your will is contested, as the witnesses will be called upon to testify. We mentioned the term "disinterested witnesses" earlier. Some areas require disinterested witnesses--in other words, people who do not stand to benefit from the last will in any way. Even if your area doesn't require them, disinterested witnesses are a good idea because if your will is contested, the witnesses cannot be accused of coercing you for their own gain. Finally, you must sign your will. It seems obvious, but since the will takes effect after you're dead and no longer around to speak for its contents, the signature is your way of attesting that this is your will and you fully agree with the contents. The signature must be completed entirely of your own free will--otherwise, if it comes out later that you were coerced, signed under duress, or signed under fraud, the entire will could be invalidated. If you're unable to sign, a representative may be allowed to sign for you with your permission and in your presence. We mentioned earlier that the last will needs to follow certain formalities in order to be considered binding. Your estate lawyer can walk you through more specific details, but here are seven key points. In other words, the paragraph immediately after the title. This will establish you as the testator, that you intend for this to be your last will, and that you are creating the will in sound mind and of your own volition. One important part is the final sentence of the introduction, which explains that any wills which may exist created prior to this one are no longer valid after executing this will (which happens when you sign in the presence of a witness). This is a short section, meant to state your marital status at the time of signing the last will as well as the names of any living biological or adopted children you may have. From here, we move on to an important part of any will: settling any remaining debts and expenses. Typically, this is done by having debts paid out of the residuary estate, which is the assets that remain in your estate after paying your final debts. By law, your legally enforceable debts must be repaid upon your death. This clause in the last will includes any specific instructions relating to the beneficiary. Typically, it states that the beneficiary must survive you by at least 30 days in order to legally receive a gift under the will. It may also include specific instructions if the beneficiary dies not long after you, as in a car accident where both of you suffered severe injuries. To put it simply, tangible property is any form of property you own besides real estate. It includes things like cars but also includes furniture, jewelry, etc. Intangible property is a non-physical asset like a bank account, retirement account, insurance, stocks, investment accounts, etc. This section outlines what will happen to that property, including what will happen if your first-choice beneficiary cannot claim the gift. If no beneficiaries can claim it, your assets will return to the residuary estate and pass to whatever beneficiaries are due to receive such property. It's worth noting that you can specify two or more such beneficiaries under the will. For example, it's common for a spouse to be the first choice and for the children to receive the property as secondary beneficiaries if the spouse doesn't survive you. Note that tangible property did not include real estate. That's because real estate is covered under the estate section. You have a few options here. You can choose to give your entire estate as a gift to one beneficiary or give it to co-beneficiaries. Otherwise, you can specify a beneficiary and secondary beneficiary to receive the residuary estate. If no beneficiaries survive you, then your estate will pass to your heirs based on the inheritance laws of the area you live in. Generally, they aim to give your estate to your spouse or closest living relative. These days, with the existence of social media and a proliferation of digital information, it has now become necessary to include instructions in your will. In the digital assets section, you can bequeath your digital assets to a beneficiary or beneficiaries, including social media accounts, digitally stored photos, online accounts, and other digital information. This section appoints the executor or executors responsible for handling your last will and distributing your property after your death. It's generally a good idea to appoint a first- and second-choice executor in case your first choice is unable or unwilling to serve. In the absence of an executor, a court will appoint one. This section grants the executors their power to fulfill the wishes outlined in your will, including any expedited procedures or unsupervised processes to administer the estate as quickly as they can. This section is your appointment of guardians of minor children. The court will need to approve the guardian and their decision will be based on what is in the best interest of the children. The Offices of the Public Trustee and the Public Guardian will step in to make sure the minor child is looked after with the least impact on their life. If you are separated or divorced, it is important to note that the other biological parent of the child or children may have the best right to guardianship of the minor children even if you appoint someone other than the biological parent. You don't want to be left in the dark when it comes to your will, and you don't want to leave a giant legal mess for your family to muddle through. This is why you need an experienced estate lawyer on your side. For common questions relating to probates, wills, and the services we provide, take a look at our services page. If you need legal resources, take a closer look at our resources page, which includes information like lawyer-client expectations. But if you need an estate attorney, don't wait until it's an emergency. Head to our contact page to start a conversation about your will and estate planning. This entry was posted in the last will by verhaeghelaw. Bookmark the permalink.